Now that the nights are drawing in and crews can no longer get out, under normal safety conditions, their minds turn to the delights of ergos, circuits and core exercises….!! Monday night saw the start of club winter training, for the adult squad. With 20 members down they split into 2 groups. Starting with the first batch doing a group warm up and then a 2K test, they then switched to mats whilst the second batch completed their test. 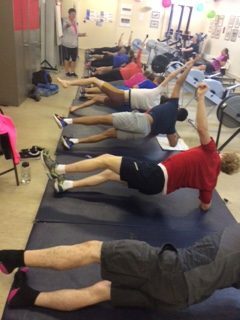 Lesley then put everyone through her, world renown, clam and core routine followed by a stretch session. Lesley does not come to every adult training session but has left a comprehensive timetable and programme on the gym notice board to your left, as you come through the door. It is your choice to do as much or as little as you want but I know the competitive spirit that rowers have, and would be surprised to find anyone “coasting”. No Replies to "Winter Training Starts"